Now can we start taking Donald Trump literally? OK, Now Can We Start Taking Donald Trump Literally? Trump’s campaign was not an act. He was making promises that he’s now planning to keep. 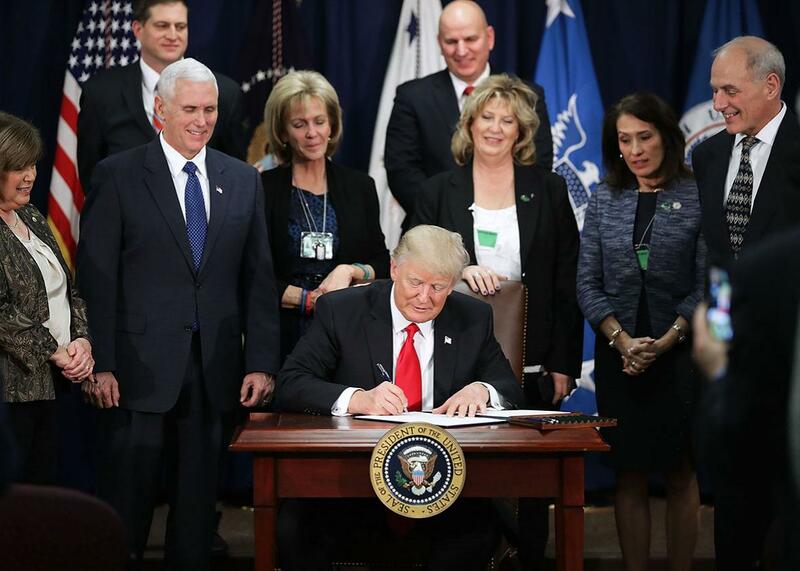 President Donald Trump signs four executive orders during a visit to the Department of Homeland Security on Wednesday. “His supporters take him seriously,” the refrain went, “but not literally.” This was the savvy line on Trump from the election: that his rhetoric—his outlandish and conspiratorial claims, his breathless attacks on racial and religious minorities—was an act. Journalists might take him literally, but his supporters (and the people who understood them) knew better. Trump wouldn’t literally ban Muslims from entering the United States. He didn’t actually believe that unemployment was 40 percent or that America was rife with voter fraud. Those were symbolic beliefs. We should take them seriously as statements of concern but not literally as guides to action. But this was nonsense, a cynical take based off of folk wisdom about politicians: They rarely tell the truth about their intentions. That folk wisdom is wrong. The fact is that politicians are often forthright about what they plan to do in office. And indeed, the best guide to a new president’s actions is simply his campaign. What did he promise; what did he say? Presidents, in other words, keep their promises. Above everything else, Trump promised to bring the power of the federal state to bear against the domestic enemies of the people, defined in explicitly racial terms. From his perch in the Oval Office, Trump would “protect” the American people from Muslim refugees, “dangerous” Hispanic immigrants, and groups like Black Lives Matter. On this, Trump was consistent. This wasn’t mere rhetoric; this was a set of serious promises to deal with literal threats. And this week, the newly minted president has begun tackling them, one by one, in rapid succession. He began with voter fraud. First, on Monday, Trump told congressional leaders that 3 million to 5 million unauthorized immigrants voted in the 2016 election, echoing a false claim he first made in late November as president-elect. On Tuesday, however, Press Secretary Sean Spicer gave it his stamp of approval, citing unnamed “studies” by unknown sources. Again, this wasn’t rhetoric; Trump literally believes that the election has been marred by an unprecedented campaign of in-person fraud. And to that point, he said Wednesday that he would ask for a major investigation into these debunked allegations. Judging from similar investigations in other states, this will likely become a pretext for federal voter restrictions, under a Department of Justice led by Sen. Jeff Sessions, who is on the verge of confirmation by the Senate. Trump wasn’t finished. There were still two items on his list of priorities: the wall on the Mexican border and the “Muslim ban.” Trump wasn’t just signaling his concern about immigration and terrorism: He literally wants a border wall, and he literally wants to keep Muslims out of the country. On Wednesday, he will take steps toward both goals with executive orders that will impose a temporary ban on refugees, block visas for anyone from Syria, Iraq, Iran, Libya, Somalia, Sudan, and Yemen, and direct the Department of Homeland Security to begin constructing a border wall. (One small problem with the latter order is that it is largely toothless unless Congress appropriates the necessary funds.) The president will also revisit the question of the CIA’s “black sites” and order a review of the Army Field Manual to determine whether to reinstate torture as an interrogation method, further fulfilling promises Trump made on the campaign trail. When Trump promised to honor the fears and resentments of his supporters with action, he meant it. He pledged that his administration would block Muslims, go after immigrants, bring back “enhanced interrogation,” and clamp down on (black) crime. Less than one week into his term, he’s doing it. And while some Trump voters will look at his actions with horror, others won’t notice, and many will applaud.